is an ambulance man (q.v.) who belongs to a recognised First Aid Corps, e.g., St. John. renders first aid to the injured pending medical attention; applies restoratives and artificial respiration when necessary; binds up wounds and fractures. a counter hand (q.v.) who is second in charge of railway refreshment room; in absence of manageress (q.v. ), acts in her place, supervising staff, keeping stores and ordering supplies. opens gates in morning; patrols arcade during day to see that regulations are not infringed; prevents admittance of undesirable persons; answers enquiries and directs strangers; locks gates in evening. waits upon teachers, pupils, etc., at a school of art, taking messages, carrying articles. in charge of a bothy or hut, where quarrymen sleep, or where unmarried male farm or estate servants are housed; does simple domestic work; prepares meals. attends to and serves customers with refreshments; cf. waiter (916). answers calls for cabs, taxis, etc., at cab stand; where shelter exists on rank, supplies cooked food to drivers; keeps cab shelters clean. sets out chairs, etc., in parks, on beaches, etc., and collects the charge made for temporary use. receives and is responsible for personal effects, hats, wraps, umbrellas, etc., left by patrons in cloak room; issues tickets and collects fees. serves customers and renders general assistance at a coffee-stall, e.g. washing up. sets and waits at tables in dining cars on railways. lays and clears tables, and waits in dining hall; also assists in keeping hall clean. a waiting room attendant (q.v.) employed in a dispensary; examines prescriptions presented by patients to ensure that they come within dispensary regulations; delivers medicine from dispenser; keeps surgery and apparatus clean. sweeps, cleans, and keeps tidy the dormitories of a college, school or other institution; makes beds; sometimes prepares weekly laundry lists. gives general assistance to Medical Officer of P.O. Medical Department, renders first aid, treats minor cases, etc. attends generally to the personal wants of an invalid, serving food, wheeling bath chair, etc. is responsible for care and cleanliness of lavatories, etc., supplies clean towels; in public lavatories, collects fees, when payable. (ii) (army messroom) as for waiter (916). looks after mentally or physically defective children during mid-day interval in a school. serves and waits on customers in pump rooms at spas. looks after children in a school playground; maintains discipline; sometimes conducts drill and organises games. attends to the needs of persons in a waiting room; makes appointments; answers telephone; ushers persons in and out of waiting room; sometimes also does simple clerical work. assists in dressing, washing and keeping clean old or infirm women in female inmate's ward of a workhouse; serves meals; cuts up food if necessary and acts generally as personal attendant in any way required. serves at the bar of a temperance buffet; duties as for barman (915). serves luncheon and tea baskets to railway passengers; also collects used baskets. obsolescent term in royal hospitals; duties now performed by head porter (917) (q.v.). see bed maker (university colleges). (ii) (university colleges') bedder (slang); makes beds, and does all lighter domestic duties in all rooms on a staircase assisted by scout (Oxford) or gyp (Cambridge) (q.v. ); makes beds and puts in order the bedrooms of residents (tutors or students). cleans and polishes boots, etc. at a small stand near a station or in a busy thoroughfare. brews or prepares coffee for drinking at stall or tavern. a member of brigade of boys organised to supply casual domestic service; lives in hostel. visits and inspects cabmen's shelters, maintained or owned by special society; reports regularly to management committee on each shelter, as to state of repair, cost of maintenance, staff, food supply, etc. dries and irons curtains, blinds, etc., in one operation by passing through calendering machine; cf. calender hand (918). carves meat into portions for serving in restaurants; in lodging and boarding houses is generally also responsible for supervision of preparation of meals. assists a caterer (911) (q.v.) in one branch or another of his business; usually as waiter (916) (q.v.). inspects tickets issued as receipt for money paid for the temporary use of chairs in park, on beach, etc. washes potatoes by means of scrubbing brush or broom in water in a pail or bucket; peels by hand with a knife; usually also slices into chips with a knife by hand or feeds potatoes into slicing machine which is operated by a lever; may also clean floors, tables, etc., of fish saloon or kitchen. general terms for workers engaged in dry or wet cleaning clothes; see dry cleaner (929) , wet cleaner (918). irons and presses coats and other heavy goods after cleaning or dyeing, by means of hot iron and damp cloth or by use of steam press e.g. Hoffman press. glazes chintz curtains, covers, etc., by dipping in a special glazing solution, and then ironing by hand or machine. in charge of Pullman Co.'s saloon railway car, collects fees for use of the car, superintends the serving of light refreshments and receives payment therefor. cleans premises of a school of cookery; washes dishes and utensils used in demonstrations and for dinners served to students; prepares vegetables; serves and sometimes cooks dinners provided from centre for schoolchildren. inspects the work of cooks in large restaurants or kitchens of caterers; examines finished dishes before they are sent out, reports to management. performs various minor duties in kitchen of hotel, restaurant or large private establishment, such as cleaning fish, plucking and drawing poultry, preparing and cutting up vegetables for soup, handing and measuring ingredients; differs from cook's apprentice (900) (q.v.) in that there is no undertaking to give instruction in cooking. sells light refreshments, sandwiches, alcoholic drinks, tea, coffee, etc. to customers at counter of bar or buffet; may be required to clean counters and assist with washing up; may also perform duties of still room maid (900) (q.v.). travels with tourists at home or abroad; obtains railway and steamship tickets, sees to clearing etc., of luggage, secures hotel accommodation, acts as guide and interpreter, suggests likely places of interest, and generally sees to the comfort of patrons. receives children brought to public day nursery; amuses, washes and dresses them serves food, feeds by hand if necessary; keeps premises clean; treats children if necessary for minor ailments. a non-resident domestic servant, doing odd household jobs, running errands, etc. receives orders and sends meals out to be consumed off the premises. soaks articles, usually wearing apparel, in spirits (naphtha, benzoline or petroleum), places them in rotary washing machine also containing spirit, then transfers them to a centrifugal drying machine to extract spirit. re-dyes articles of clothing, upholstery, etc., by dipping in vats of colour in solution, mixes colours and regulates temperature of the dye vats; may first clean, if necessary, see wet cleaner (918). guards an estate, patrols the grounds, sees to security of gate, locks, etc. general term for workers in finishing department of job dyeing and dry cleaning works; see clothes presser, calenderer, glazer, cylinderer (918), ironer, ironer and finisher, gofferer (918), presser. cleans fireplaces, lays, lights and maintains fires in large establishments; carries coal. fries fish and chip potatoes in wire baskets dipped in batter and in boiling fat in tanks or pans; cleans frying range. cleans and polishes floors of wood, mosaic, linoleum, etc., by rubbing with floor polish and a cloth mop manipulated by hand. a personal attendant or outdoor valet who accompanies his employer and friends on angling, shooting or deer stalking expeditions; assists in carrying fishing tackle, baskets, bait, guns, lunch baskets, etc. ; keeps poachers from fishing or shooting preserves. a dry cleaner (q.v.) who removes dirt from gloves; may also clean by wet method, see wet cleaner (918). cleans and stretches gloves with glove stretchers, in finishing department after dyeing or cleaning. acts as guide in a home for blind children, or conducts blind children from their homes to school. (iii) (tourist agency) is engaged by tourist agency to conduct travellers round towns and other places of interest, pointing out and describing the principal features. a male personal servant to resident members of a college at Cambridge University; works for rooms on a "staircase"; assists bedmaker (q.v.) in all heavier domestic duties; carries water and coals; lights fires; serves meals from kitchen; may also wait at dinner in hall; cf. scout. slices ham and beef in ham and beef shop, restaurant or dining rooms, using carving knife or slicing machine. does odd jobs about a house, such as small repairs to locks and bells, cleaning boots, carrying coals, etc. lays and clears tables, waits, clears and generally assists at a dining centre. attends at entrance of hospital or infirmary to direct and assist patients and visitors; makes up furnaces, fetches stores by hand or trolley, packs and unpacks cases; wheels patients to and from operating theatres, etc. keeps hostel clean; waits on the boarders. responsible for the purchase, care and arrangement of all floral decorations in a hotel. does unskilled outdoor work at a hotel, watering horses, sweeping yard, etc. irons and presses (or finishes) articles after they have been cleaned or dyed, with flat iron (generally heated by gas or electricity) or on an American patent steam pressing machine, called Hoffmann press. a non-resident manservant, who acts as butler for special occasions in private families where no regular butler is kept; cf. butler (900). cleans steel of knives with emery powder on knife board or in knife machine; usually employed in restaurants, etc. ; obsolescent occupational term. wakes up workpeople in their homes daily by rapping or knocking at doors or windows at a fixed time each working day. washes, lays-out, prepares and dresses body for burial. checks linen of an institution on its return from laundry, and on issue for use; and sends soiled linen to laundry. shows guests or patrons at night to and from carriages or motors; calls vehicles by number; (term practically obsolete). cleans lobby, the quarters used by workmen between shifts or working periods; washes floors, baths, wash basins, cleans taps, etc. in general charge of the business arrangements of a club; appoints and controls staff, orders supplies, sees to catering, etc. manages railway refreshment room; see railway refreshment room manager (911). a steward or purveyor of food at a university college; obsolescent term . (ii) chief of proctor's attendants ("bull-dogs"). stands at door of mason's lodge and guards against entrance of unauthorised persons. attends to the health and welfare of boy and girl telegraph messengers at a large post office,; responsible for discipline; supervises cooking of meals in messroom. assists generally in mess room, cleans and prepares tables for meals, waits, clears away, washes up, etc. is employed by mess caterer (911) (q.v.) to assist in mess room, cleaning, preparing for meals, waiting, etc. cleans surgical instruments and sterilises them in bath of lysol, etc. ; attends on anaethetist [sic] and surgeon, supplying with instruments, cotton wool, cloths; work usually done by qualified hospital nurse (844). 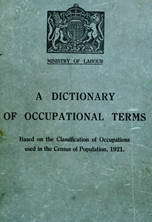 a general terms which include servants whose main duties are performed out of doors, e.g., gardener, (013) stable boy, (725) (q.v.). opens oysters, usually by forcing shells apart with a strong knife; sometimes serves them at oyster bar. cleans by washing, scrubbing and polishing, pans and other kitchen utensils in the kitchen of a restaurant, etc. washes and polishes silver and electroplate in plate room of a restaurant, etc. polishes with a dry cloth plates dried in rack or in drying chamber (large restaurants and establishments only). washes and drys [sic] plates, dishes, etc., in restaurants, etc. has charge of women prisoners at a police station, and in police court; is responsible for the searching of women and girls charged at the station. cleans and polishes, by rubbing with a special metal polish, brass and other metal work in an hotel, etc. takes to pieces or unpicks garments or upholstery before dyeing and cleaning. an unofficial detective engaged to make personal enquiries as to conduct, etc. (especially for divorce cases), and to watch suspected persons. a personal servant to college residents at Oxford University; works for a set of rooms or "staircase"; carries water and coals; helps bedmaker (q.v.) make beds and cleans rooms; serves meals from kitchen; may also wait at dinner in hall; cf. gyp. fills coal scuttles in large hotels and clubs; attends to fires, etc. serves clients in the smoke-room of an hotel or inn with tobacco, drink, and light refreshments. sorts articles received at depot for dyeing or cleaning; marks and labels them for respective departments. renders paid assistance in some capacity or other in a soup kitchen (cook, scullery-maid, etc.). removes, with suitable chemicals, such stains upon articles as are left after spirit or dry cleaning process. brushes, on steam bed, articles of clothing after dyeing and cleaning. usually in resident charge of club house, institute, etc. ; keeps premises clean; provides, prepares and serves food, drink and tobacco; collects fees for use of billiard tables, green fees, etc. requisitions food, supervises preparation and service of meals in railway dining car; controls waiters and kitchen staff; examines dining cars to ensure cleanliness; on some railways travels with dining car, on others inspects cars before they leave terminus; duties are wholly supervisory. washes hat, bleaches it with chemical solution, dries it, and replaces hat band and lining. provides material for homeworkers, supervises work done and collects (sometimes markets) finished article. exercises general supervision at a dining centre; controls staff, sees that meals are properly prepared and served, etc. arranges ornaments, flowers, shaded lights and other decorations on dining tables in hotels, restaurants, etc., or on special occasions for weddings, dances, etc., at private houses. commands silence and announces the toasts at public banquets. solicits custom for hotels, etc., at railway stations, steamboats, wharves, looks after luggage, and conducts to hotel conveyance, etc. sells light refreshments, sweets, fruit, etc., from a trolley to passengers in a train at railway station. as for scullery maid (900). as for wash-house man (918).